Image: Boom Studios. RoboCop: Citizens Arrest #1 Variant Cover by David Rubin. After a few years away, Boom Studios is bringing the world’s most beloved cyborg cop back into action with a brand new miniseries. But this time, RoboCop finds himself in a weird dystopian future: one where law enforcement isn’t performed by cops, Robo or otherwise, but private citizens. 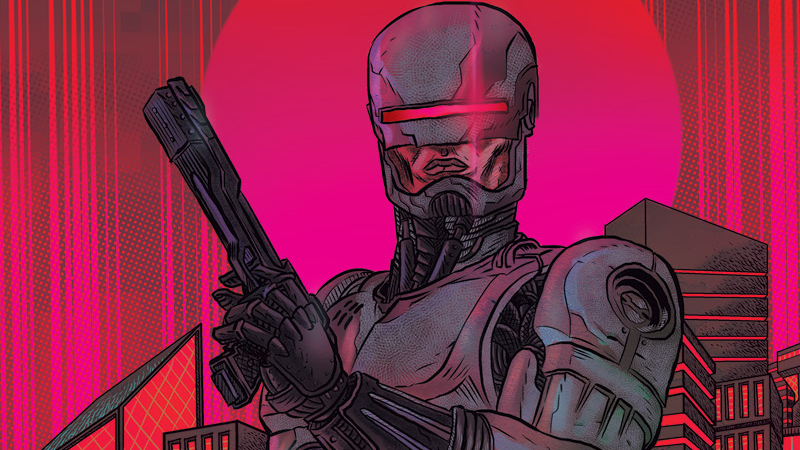 Written by Brigg’s Land’s Brian Wood, and with art by Jorge Coelho, io9 can exclusively reveal RoboCop: Citizens Arrest, a new series set 30 years after the events of 1987's RoboCop movie. Decades after the RoboCop program first began, law enforcement has taken a decidedly different track in the time of Citizens Arrest—corporate control has reached out across Detroit to control everything from education to local government itself. RoboCop: Citizens Arrest #1 Variant Cover by David Rubin. On top of that, police work has become the ultimate private contract, with the population encouraged and rewarded for constantly surveilling and reporting on their fellow citizens with apps that promise them that they can be their “own RoboCop.” But where does that leave our titular tool of justice? We spoke to Wood and Coelho to learn more. io9: What drew you to the idea of a new RoboCop series in the first place? Brian Wood: RoboCop hits a whole bunch of topics and themes that are important to me, that feel relevant and feel like good drama. And that stand the test of time - think about that original film that was all about union busting, the militarization of police, privatizing public services, and abusive media. In some ways it feels more topical now than in the 80's. I want to talk about that, I want to hit that hard. But it’s not just about the creative process - I love RoboCop, I was right there when it first came out and it blew my mind, so over the top in its violence, so biting in its humor. Jorge Coelho: The character and its universe in itself were a big draw - I have always loved the concept. I couldn’t believe I was actually asked to work with one of my favorite movie franchises! What can you tell us about where we find Alex Murphy heading into the series? Is he still the sole RoboCop, or have more like him been made? Wood: Alex Murphy is there, but marginalized, pushed to the side to make room for this new generation of Robocop... as a concept. It’s not just that there’s a new model of Robocop out there, but we have an entirely new OCP with an entirely new way they’re looking to privatize and militarize law enforcement that makes every citizen a complicit actor. We’re decades past that original film, and a lot’s changed. Alex Murphy, when we meet him, lives in obscurity. The original RoboCop has a very ‘80s view of the future, aesthetically. Is that something you wanted to continue in the series, or will it have a more “modern” take on the future? Wood: It’s modern, slightly futuristic even, and brings in a lot of modern social themes that were not present in the original film - immigration issues, toxic celebrity, crowd-sourcing, mob rule - but the goal, something everyone agreed on day one had to happen here, is the tone of that original film. Not just the visuals, not just the violence, but that biting social commentary, the dark humor, the media jabs. Coelho: Yes and no, because destruction has that kind of uniformity and Detroit hasn’t become a clean cut city in our story. It will be technologically more advanced but still embroiled in poverty. RoboCop: Citizens Arrest #1 Main Cover by Nimit Malavia. Will Citizens Arrest take any influences from the sequels, or will it mainly continue on from the first movie? Wood: I’m only looking at the first film, to launch this title. But my mind is open and if the story takes us to a place where we can pull elements from the sequels, we will. I sort of love the sequels, I love how Frank Miller’s style is all over them. Coelho: It will take the mood and respect the originals, reinterpreting them, as far as I’m concerned that’s the best kind of respect, adding our points of view to the mix while still working within the framework. A version, not a cover, for a song we love. There’s a lot of socio-political subtext to the world of RoboCop. What made now the right time to bring the franchise back, in comics form? Wood: I’ve spoken a bit on that in earlier answers, and I’ll add here just surprised-not-surprised I was how relevant this material is now. I think if we deliver it right, it’ll be something special . Coelho: Unfortunately for the most connected to social and technological advances I believe today we are closer to the eighties classic dystopia than thirty years ago. That’s called pertinence in my book. RoboCop: Citizens Arrest #1 Variant Cover by Jim Towe. The series is being teased as set in a future of “crowdsourced justice,” which arguably has parallels to what we see today with the growing rise of social media’s role in debating social issues. 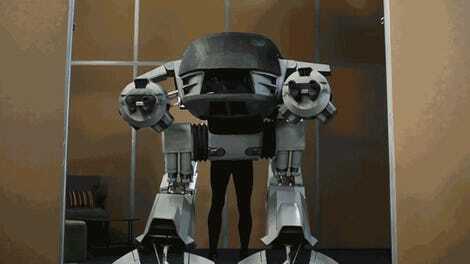 How does Citizens Arrest extrapolate that concept for the time of RoboCop, and how does it go beyond it? Wood: I understand the parallels to social media, but for me—and granted this will mean more once you see it on the page— the idea of crowdsourced justice is bigger than just pointing out the dangers of social media, and includes vigilantism, mob justice, class divide, and how people react to ‘the other.’ And all that is one step removed from more passive, less obvious things like segregation and gentrification. While set in a morbid near-future, RoboCop is also a darkly funny franchise. Was that dark humor an important element you wanted to include in Citizens Arrest, as well? Wood: That original film would not have worked without the humor, and I don’t think this book will either. Coelho: Yes, we need humour, humour is a phycological valve that needs to be used to keep us sane. What do you think still resonates about the world of Robocop, 30 years after it first released? Coelho: Oh, the way sometimes corporations use human nature to their benefit, blind greed, apathy, radicalization and social polarization. RoboCop: Citizens Arrest is set to hit shelves in April.